Presentations are the most important factor for the approval of designs in the world of graphic design. Graphic designers are working efficiently on ad campaigns to give them new look, new ideas and clear conceptual approach to artworks. They try to produce and create out of the box artworks each and every time. While working on outdoor media campaigns designs should be appealing as well as eye catching that grabs the passerby attention and this is the success of the campaign forcing the visitor to read and never overlook. In outdoor media so many new techniques are used in these days either static as well as animated. It has been seen that 3D approach to designs are attention getting and discussed by the onlookers. Whatever the project given to the advertising team they have to present in an impressive manner. Most of the time presentations are vital role for acceptance of new ideas. Every single presentation will become the part of your project. Visitors, interested buyers or regular customers they will all get inspired by the outlook first, either it is the business of fashion, textiles, footwear, pret wear or any other display product. Remember one thing “good design sells” and “good presentation approves”. 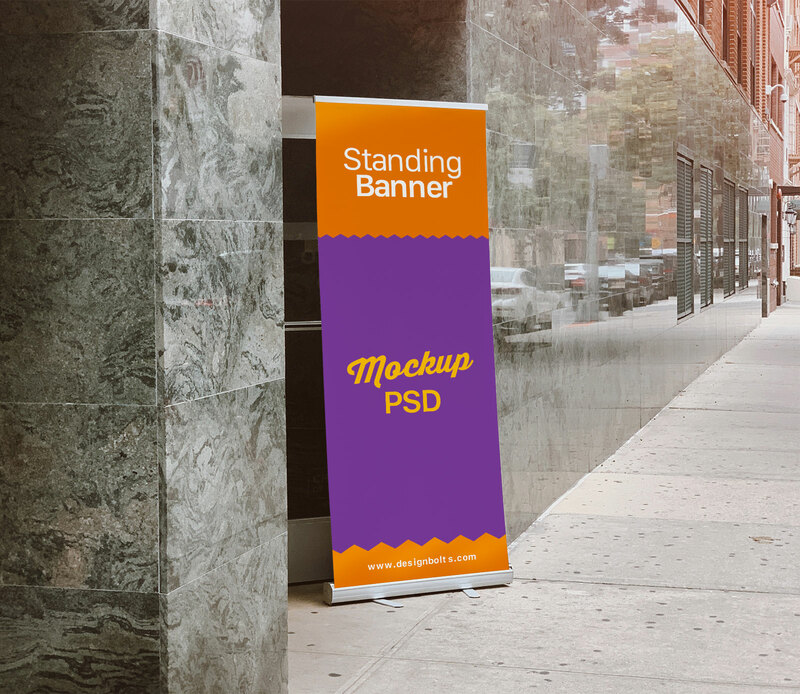 Today, we are sharing a free standing roll-up banner mockup placed on the pedestrian to receive maximum view. You can insert your design and present this mockup with confidence to get instant approval of the artwork. This mockup will surely help you to add value to your outdoor branding project. Download details are all mentioned below. For more high quality mockups you can subscribe us and get crazy good freebies. You can also bookmark us to check later. We have a great range of graphic design inspirational artworks as well premium quality freebies.